Brink’s Market has been a family owned grocery store since 1919. Oscar Brink started working in 1898 for Nelson’s Grocery on Payne Ave in St. Paul’s east side and in 1919 decided to start his own store. 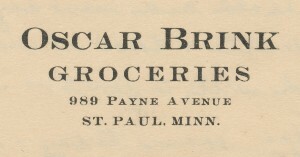 Brink’s Grocery was located on lower Payne Ave. in St. Paul. In 1947 Oscar retired from the grocery business. In, 1952 Oscar son Milton, opened a store on Park Dr. in St. Paul, which he operated until the early 1960′s. In 1962, Milton bought 3 small adjoining buildings on Main Street in Center City, MN. He opened Center City Superfair in the Fall of 1962. Milton, his son Sandy, and Milton’s sister Hazel operated the store until 1968 when he sold the store to his brother Roger Brink Sr.. In 1971, Roger Brink Sr. moved his business to Chisago City. They leased space in a new building on Hwy 8 (currently the Dollar Store). Roger Brink Sr. had two boys, Roger and Kevin, who worked with their dad at the Chisago store. The boys decided to try a new format store in Chisago, so they opened the Food Depot in 1976. The Food Depot was different then there conventional store in Chisago, with a warehouse type format. In 1986, Roger Jr. and Kevin purchased the store from Roger Sr.. They combined the Chisago Brink’s store and remodeled the Food Depot changing the name to Spree Market. Spree Market was open until 1997 when it was remodeled to the current store, Brink’s Market. Kevin and Roger still own and operate Brink’s Market. Roger’s 3 children; Andy, Sara and Nathan have grown up in the business and are currently managing different areas of the store.